These tastefully decorated rooms with white percale linen offer air conditioners and heaters as well as DSTV and tea and coffee facilities. Spacious family rooms as well as rooms with twin beds with air conditioners, heaters, DSTV and tea and coffee facilities. Bunk beds, communal bathroom and with their own swimming pool. 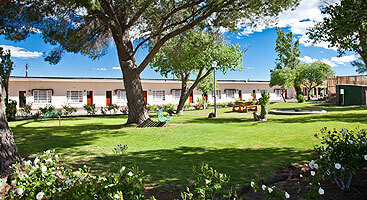 The very popular and well-known Wagon Wheel Country Lodge is conveniently located just off the N1, just 1km from the charming Great Karoo town of Beaufort West on the Johannesburg side. The new owners have not only restored the charming Wagon Wheel’s dignity but have also upgraded all the deluxe rooms with crisp white percale linen. The newly revamped rooms offer you the best value for money at very affordable rates. To satisfy the needs of all travellers we offer various types of accommodation from Deluxe and Standard rooms to family units, self catering, caravan facilities and backpackers accommodating up to 150 guests. Surrounded by the spectacular scenery of mountain and desert views, the Wagon Wheel offers you warm hospitality and great comfort in a unique setting. Cool off in our sparkling swimming pool after a days traveling before enjoying a refreshment and braai in our new boma while watching the Karoo sun set. There is also the option of unwinding in the Ladies Bar and then enjoying a homemade Karoo dinner in our á la carte dining room. This is the perfect overnight accommodation on the N1 main route between Cape Town and Johannesburg.